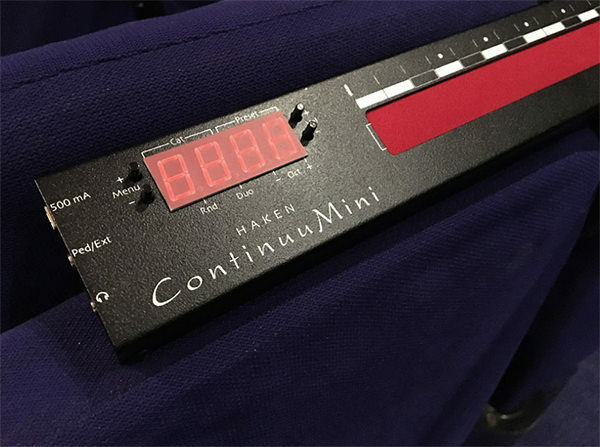 This looks fun...Haken Audio have announced plans for a smaller, affordable version of the rather exclusive Haken Continuum. Yep, it's certainly a lot more affordable! I have played a continuum before and would love one but this one looks a bit strange to me, at first I thought it was like one row of a linnstrument but it only supports two fingers, what's the point in that? Unless I am missing something? I guess you could think of it more along the lines of Eowave's Ribbon, but with vastly improved look, feel and sound engine. At first glance I thought the guy was wearing it on a shoulder strap which would be cool, before I realised it was just his braces. 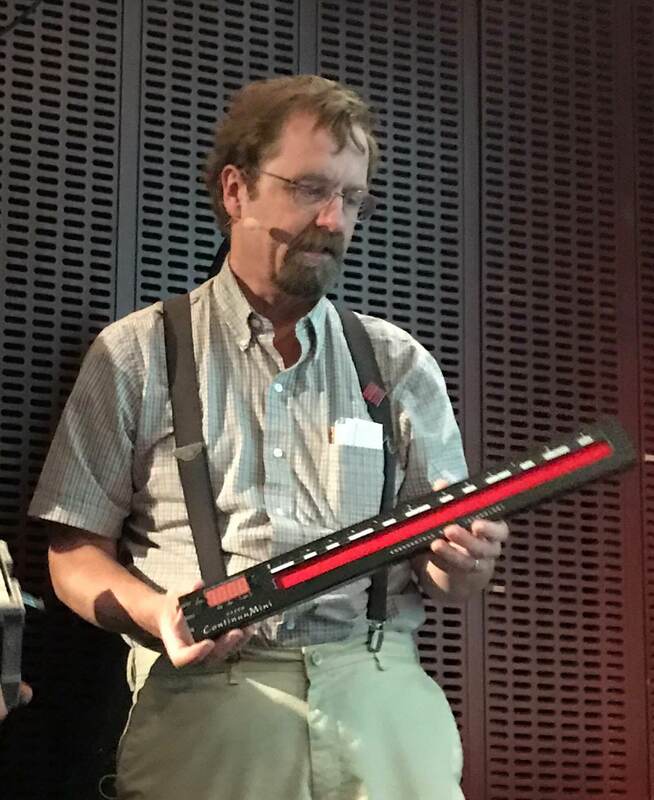 ...just had a friendly email from Dr Haken to confirm that this new gadget will be strap-ready; he'd already had the request from Continuum fan Éric Mouquet. Looking forward to this. Tier 1 was gone within hours, and Tier 2 is selling fast. I agonised about it for a few minutes and had just decided not to, then I saw your post and went for it. I think you made the right choice, hopefully. When it was first announced I wasn't sure if the point of it thinking it was just a controller, I didn't realise it had the Eigen synth inside. From the kickstarter video it looks like this is also playable over midi. 278 backers with 4 days to go. I think it reached 300. I played one and it felt like I was sticking my fingers into a mail slot. I often touched the sides. Great sound though. I did wonder about that, on one of the videos you can see the playing surface moving down quite a bit. ...so, Continuumini arrived today. WDYT BobTheDog...? I'm perhaps fortunate in never having played a full Continuum, because then I'd want one for sure...but at £3800 or so for a half-size one, it's just not going to happen. They never turn up secondhand, and there are several cheaper things higher up on my "...that looks nice..." list. ...I like that it has the same excellent built-in synth engine, the EagenMatrix, since most of my gadgets are MIDI controllers. It's nice and compact and light, and I'm looking forward to showing it off with a guitar strap. There aren't many ribbon synths around, and it's a pretty nice one. Pressing the control plate probably isn't quite the same as carressing the red cloth of a full-blooded Continuum, and you might want an additional control for full 3-axis expression rather than relying on the tilt sensor. But, it ain't half bad if you like ribbon synths. I've seen a second-hand Persephone go for more, and - yes, those look pretty cool, but as an expressive musical instrument, I doubt it has the potential of the Continuumini. I'm going to have some fun with this. BJG145 wrote: ...so, Continuumini arrived today. WDYT BobTheDog...? Well EagenMatrix is fantastic, for me this is worth the asking price but that is because I am playing it from the Linnstrument, they are perfect partners. The Continuum playing surface though I think for me is not so good, the Y axis is basically unusable and the Z axis is not linear across the surface. So for me it is rescued as a sound module for the Linnstrument, without that I would have been disappointed. ...that's an interesting idea; I've not seen a Linnstrument yet. I'd agree that EagenMatrix is nice, but that the playing surface may leave something to be desired if you're used to certain other controllers. I haven't seen one of those before...looks like a phonofiddle without the bell...? I have a Pico, the engineering of the hardware is top notch, the software left a lot to be desired though but I think this may have improved now. Mark Harris (thetechnobear) who is a smart cookie has worked on the eigenharp software and general MPE so I am guessing there is a way there with eigenmatrix. I cannot recommend the Linnstrument enough though. Compared to an Alpha, not only is it much cheaper you don't need some sub-par software running on a computer to use it. Everything on the Linnstrument can be controlled/setup from the Linnstrument surface itself, it is a masterclass in design.